How to convert video to Samsung video MP4 format? 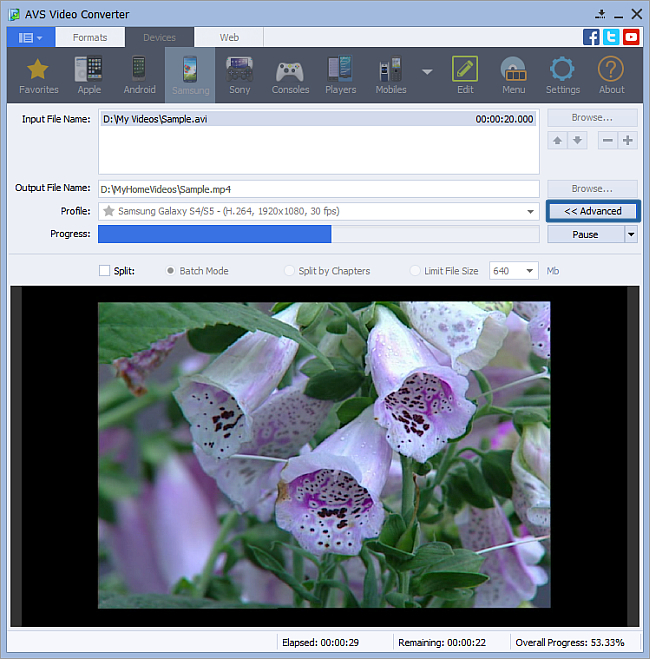 If you would like to watch your favorite home video on a Samsung Galaxy smartphone or tablet, use AVS Video Converter to convert your video to Samsung Galaxy (MP4/h.264) format and upload it to your device in a few clicks. AVS Video Converter uses AVS Mobile Uploader included in the AVS Video Converter installation package to upload the files to your Samsung Galaxy. After you have selected the video input file, open the Devices tab of the Main Toolbar and press the Samsung button. Drop-down the Profile list and select one of the offered Samsung profiles. You can also click the Advanced >> button to manually set the Samsung profile parameters in the Output File section of the opened Conversion Options tab. Note: to convert your video for Samsung you can also use the Formats tab of the Main Toolbar. Press the To MP4 button and select the needed Samsung profile from the Profile list or press the Advanced >> button to change output parameters manually. When the process is over the following window will be opened. 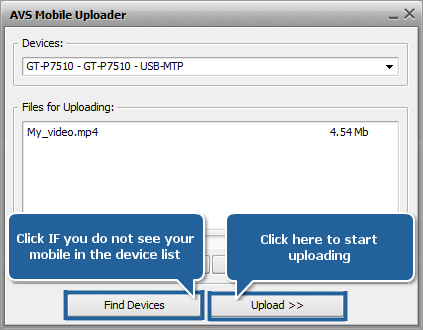 Click the Upload... button to launch AVS Mobile Uploader. Connect your Samsung Galaxy to your computer with the help of a cable. Turn on the Samsung Galaxy. The AVS Mobile Uploader application will be launched to guide you through the upload process so that you could send your converted video file to your Samsung Galaxy with no difficulty. When you click the Upload>> button the upload process itself will take place. It will take some time depending on the output video file size. Now you can enjoy your favorite home video DVD and video files on your Samsung Galaxy!